Tim Tebow does not have any MLB stats for the season. Timothy Richard Tebow graduated from Nease High School (FL) where as a junior he batted .448 with four home runs and 25 RBI...Was named all-first team by the Florida Times Union...Skipped his senior year of baseball to enroll early at the University of Florida...Created the Tim Tebow Foundation in 2010 with a mission to bring faith, hope and love to those needing a brighter day in their darkest hour of need...Held the fourth annual Night to Shine Prom Experience for special needs students ages 14 and older on February 9, 2018...Over 175,000 volunteers from more than 540 churches will honor more than 90,000 guests...The churches represent all 50 states, 16 countries and 33 different denominations...Financed the Tebow CURE Hospital located in Davao City, Philippines...The Hospital opened in 2014 and provides surgeries to heal children and adults...Created Timmy's Playrooms, which are spaces in hospitals that are designed for patients and their families while they undergo treatment and extended hospital stays... These playrooms are located in hospitals throughout Florida, Tennessee, Texas and Louisiana...Began working at ESPN in 2014 as a college football analyst...Mainly appears on the SEC Network but contributes to other ESPN platforms... Co-hosted Good Morning America on January 31, 2014 with Eli Manning...Authored three books Through My Eyes (2011), Shaken (2016) and Know Who You Are (2017)...Was inducted into the Florida Sports Hall of Fame in a ceremony with former NFL running back Warrick Dunn and major leaguer Chipper Jones on November 8, 2017. In his first year of professional baseball, he divided the year between Columbia (A) of the South Atlantic League and St. Lucie (A) of the Florida State League...Started the year with Columbia and moved to St. Lucie on June 26…Played in 64 games in the SAL and 62 contests in the FSL...Hit a home run in his first professional at-bat with Columbia on April 6 vs. Augusta off Domenic Mazza…It was a two-run shot... Slugged eight home runs combined, including a walk-off home run off Austin Orewiler to beat Daytona, 5-4, in the second game of a doubleheader on July 13...Had a 12-game hitting streak from July 2-14, going 12-40 (.300) ...In 29 games with St. Lucie in July, he batted .260 (26-100) with four home runs and 19 RBI...For the year, he had 22 multiple hit games (17 contests with two hits and five games with three hits)...Had three RBI four times (April 9 vs. Augusta, April 16 at Augusta, July 3 at Fort Myers and July 29 at Charlotte)...Batted .148 (4-27) during Spring Training for the major league club. 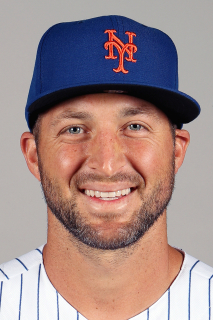 March 29, 2019 LF Tim Tebow assigned to Syracuse Mets from Binghamton Rumble Ponies. January 17, 2019 New York Mets invited non-roster LF Tim Tebow to spring training. September 21, 2018 Binghamton Rumble Ponies activated LF Tim Tebow from the 7-day injured list. July 21, 2018 Binghamton Rumble Ponies placed LF Tim Tebow on the 7-day disabled list. January 19, 2018 New York Mets invited non-roster OF Tim Tebow to spring training. June 26, 2017 LF Tim Tebow assigned to St. Lucie Mets from Columbia Fireflies. March 27, 2017 OF Tim Tebow assigned to Columbia Fireflies. March 8, 2017 RF Tim Tebow assigned to New York Mets. October 8, 2016 OF Tim Tebow assigned to Scottsdale Scorpions. September 9, 2016 OF Tim Tebow assigned to GCL Mets. September 8, 2016 New York Mets signed free agent OF Tim Tebow to a minor league contract.